Last Monday my danish club, Philidor, played our 5th match for the season. We managed to win pretty convincingly with 8-0, so it doesn't really make any sense to dwelve further into the match. Instead I am going to write a few things about the team. 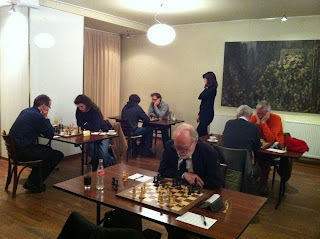 Philidor is a chessclub which was born in the autumn of 2011. The main man is Jan Andersen a former junior elite player in Denmark who recently took up chess after a break of many many years. When his daughter's school wanted to have some chess, he got interested and is now very involved in school-chess. He then thought that the chessplayers in the school should have a decent club to look up to, and therefore started an adult club and invited some friends to play. As a new club we started in a low divison but the goal is to win every year and rapidly advance to the top leauge, Skakligaen, and win it. Swedish GMs Emanuel Berg, Hans Tikkanen and myself. as well as a couple of others..
Half of our team: Me, Tikkanen, Moe and Hamann! With such a team the goal of quickly becoming the best danish club doesn't seem too ambitious as we arguably already are the strongest!